[Source: blastr.com] We're all truly saddened today to report the news that legendary actor, horror movie icon and heavy metalsmith Sir Christopher Lee has passed away at the age of 93. The actor had been hospitalized for respiratory problems and heart failure at London’s Chelsea and Westminster Hospital, where he died on Sunday. The Guardian reports that the news was made public only today so that his wife could first inform the family members (not, as many have contended -- only half-jokingly, I'm sure -- to be sure that he wouldn't rise from the dead after three days). They had been married for more than 50 years. Lee shot to fame in the late 1950s, when he starred as Dracula in a slew or classic Hammer horror films which introduced many a generation to the Prince of Darkness, but he's perhaps best known to younger genre fans as the face of Saruman in Peter Jackson's Lord of the Rings films and Count Dooku in the Star Wars prequel trilogy. Sir Christopher Lee was born in 1922 and went on to serve in the Second World War. He turned to acting in 1947, and his first notable role was in a gothic romance called Corridor of Mirror. The actor began his association with Hammer not as Dracula, but by playing The Creature in 1957’s The Curse of Frankenstein. He became the legendary vampire for the very first time the following year in Horror of Dracula. His other appearances as the infamous Count included Dracula: Prince of Darkness, Dracula Has Risen From the Grave, Count Dracula, Dracula A.D. 1972 and The Satanic Rites of Dracula. Other horror flicks Lee took on (outside of his relationship with Hammer) were The Mummy, Rasputin, The Mad Monk and The Hound of the Baskervilles. Lee also played Dr. Fu Manchu in the late 1960s, and turned in an unforgettable performance in Robin Hardy's classic horror movie The Wicker Man. He also appeared in the 1974 James Bond movie The Man With the Golden Gun, in the role of Scaramanga. 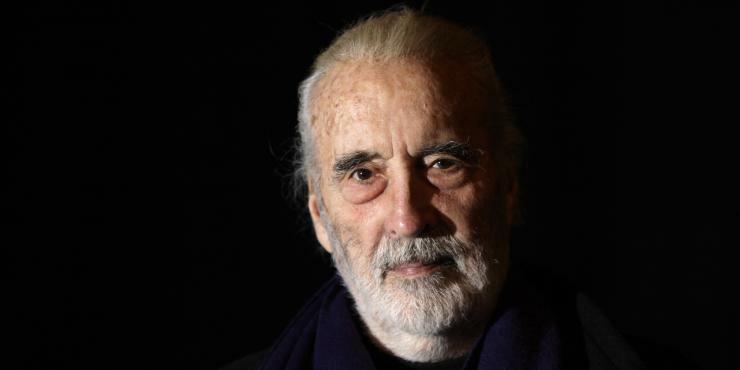 Christopher Lee was (re)introduced to a whole new generation of moviegoers starting in 2001 when he played Saruman the White in Peter Jackson’s Lord of the Rings and The Hobbit movies. He also played Count Dooku in the Star Wars prequels Attack of the Clones and Revenge of the Sith. The actor even made a notable cameo appearance in Tim Burton's Dark Shadows in 2012. Lee had a wide-ranging career (he has more than 281 credits to his name on IMDb), from the theater stage to the silver screen to the big screen. He was absolutely indefatigable. Sir Christopher Lee also made some very notable TV work — he began appearing on the small screen in the mid-1950s — and made some guest appearances in The Avengers, Space: 1999, Young Indiana Jones Chronicles, The Tomorrow People, Tales of Mystery and Imagination, Gormenghast and more. The actor also did some voice-over work for Tim Burton’s Corpse Bride and Alice in Wonderland, as well as numerous videogames (his most recent being LEGO The Hobbit). He also had a prolific music career, which included two heavy metal albums -- Charlemagne: By the Sword and the Cross and Charlemagne: Omens of Death. He was awarded the "Spirit of Metal" honor at the Metal Hammer Golden Gods ceremony in 2010 ... at the age of 88. That rules. Lee was knighted in 2009, and in 2011 he received a BAFTA fellowship. Lee promised that he would never retire from acting and once said: "I hate being idle. As dear Boris [Karloff] used to say, when I die I want to die with my boots on." There are many things the actor dabbled in, but acting was his first love, and the thing for which we most loved him. But he was also a huge nerd who read The Lord of the Rings once every year, knew entire passages by heart and actually knelt before J.R.R. Tolkien on meeting the author by chance in a pub, and we loved him all the more for it. I think it best to leave it on another quote, from a 2013 interview: "Making films has never just been a job to me, it is my life. I have some interests outside of acting — I sing and I’ve written books, for instance — but acting is what keeps me going, it’s what I do, it gives life purpose." R.I.P., sir. You shall be missed.